There has been virtually no growth in employment among young Canadians over the course of the last three years. 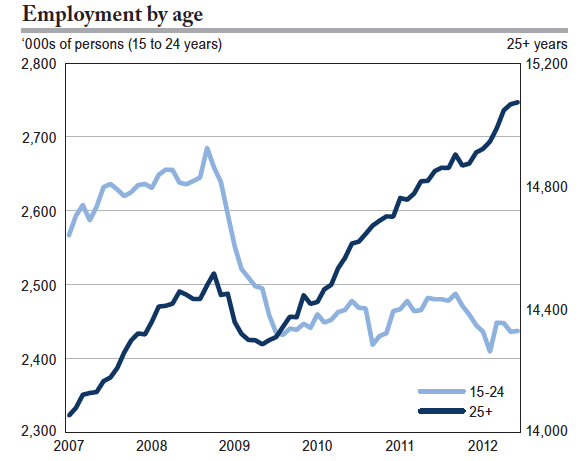 Employment plummeted in late 2008 for those younger than 25, and has gone nowhere but sideways since . This is in sharp contrast for older groups: their employment levels recapturing all the recessionary losses by 2010. Tavia Grant, a reporter with the Globe and Mail, offers a nice summary of a Statistics Canada report that describes recent economic developments in an article called “Older workers have the edge in the current recovery.” But a picture from the study by Cyndi Bloskie and Guy Gellaty tells this story most clearly. Source: Bloskie and Gellaty (2012), Chart 2. Read the employment levels for 15 to 24 year olds in thousands off of the left scale, and that for those 25 and older off of the right scale. Between September 2008 and August 2009 employment among the young fell by a quarter of a million, and has been virtually stagnant since. These patterns have been clear for some time, and in fact might be worse than the picture suggests because they do not even correct for the growth in the underlying population. And it is even worse for Aboriginal youth I would assume. That may certainly be the case, but I don’t know how the recession versus longer-term structural issues play out in this case. It would also be interesting to look at employment by immigrant status, since immigrants—particularly recent immigrants—like youth do not have a strong foothold in the labour market. With less experience and fewer connections they also are likely to have more difficulty. We also should look at rates of continued schooling. Plant type jobs (i.e. manufacturing) are dying. The only option may be to continue schooling to hope for something better. Thanks Paul. Ms. Grant and the Statistics Canada report do talk about uenmployment rates, but a look at participation rates and school enrollment would round out the picture.